Arsenal XI: Cech, Bellerin, Mertesacker, Koscielny, Monreal, Ramsey, Flamini, Oxlade-Chamberlain, Ozil, Walcott, Giroud. Newcastle XI: Elliot, Janmaat, Coloccini, Mbemba, Dummett, Sissoko, Tiote, Colback, Wijnaldum, Perez, Mitrovic. Aaron Ramsey nearly scores a goal fitting for an Alan Partridge commentary. The Wales midfielder slalomed liked an Olympic skier inside the area, but his bending effort bent too wide of Rob Elliot's far post. Newcastle's Rob Elliot makes a great low save from Aaron Ramsey's low angled shot. There might still be another goal in this. But at which end? Newcastle have another headed chance. This time Gini Wijnaldum heads over from eight yards from Daryl Janmaat's cross. Do the Magpies need a striker in the January window? Newcastle are desperately looking for an equaliser. They have played well today. Striker Alexander Mitrovic, who lately seems incapable of hitting a barn door, heads over the bar from 10 yards out. There is a little less than 10 minutes remaining of normal time. BBC Newcastle's NUFC summariser John Anderson: "It's not the greatest corner in the world. Perez didn't react to it. It's tough on Newcastle but they've got to keep going." It wasn't coming. It really wasn't coming. Defender Laurent Koscielny was switched on but Newcastle's Ayoze Perez was switched off. A corner from the right eventually finds the head of Olivier Giroud who heads on to Koscielny. His fellow Frenchman is allowed to poke in almost unchallenged by Perez, who seems to have been ball-watching. Arsenal have brought on Joel Campbell for Alex Oxlade Chamberlain. They look a bit stuck for ideas. The lofted ball from Jack Colback was easily cleared, but the Magpies continue to attack. Moments later, centre-back Chancel Mbemba bullets a header over. Newcastle pressing and pressing. Free-kick from 35 yards out. Cheeky effort by Olivier Giroud. The France striker is fed into the area by Laurent Koscielny - his dinked shot goes over the head of keeper Rob Elliot but also on to the top netting. There is something wrong with the Arsenal tempo. The wet surface should be perfect for their 'zipping passes' but they haven't zipped and look a little leggy. GREAT SAVE BUT POOR FINISH! It should have been 1-0 to Newcastle. Ayoze Perez finds Gini Wijnaldum, who has just Petr Cech to beat, but the Gunners keeper spreads himself well. Should the Dutchman have dinked it? Moments later, Olivier Giroud puts too much glance on a glancing header from Nacho Monreal's cross. Back at the other end Alexander Mitrovic fires over from close range, although the ball arrived at an awkward height. Newcastle begin the second half like Arsenal did in the first half - on the front foot. Moussa Sissoko drills in a cross from the right but it bypasses everybody. Newcastle get us back under way. BBC Newcastle's NUFC summariser John Anderson: "Newcastle have had the better chances. Cech's been the busier of the two keepers, Rob Elliot hasn't really had a save to make. Newcastle will be pleased at half-time." What do you make of that Arsenal and Newcastle fans? The Gunners don't look like potential champions and the Magpies don't look like relegation candidates. "Newcastle are playing with courage and bravery, but they have to take their chances. If Arsenal harbour hopes of winning the title then this is a game you expect them to win." It's absolutely teaming down at the Emirates Stadium. "Arsenal are finding it hard, but Newcastle are playing well. They are sitting deep and looking good on the counter attack and Steve McClaren will be the happier of the two managers." Daryl Janmaat's dinked delivery from the right finds Alexander Mitrovic, whose tame overhead effort is easily claimed by Arsenal keeper Petr Cech. Moments later, Gini Wijnaldum's low shot at the back post is pushed away by the Czech keeper. Good stuff from the Magpies. Arsenal have temporarily switched off. Newcastle skipper Fabricio Coloccini puts in a great block to deny Olivier Giroud whose angled shot was on target. There has only been one goal in the six 15:00 GMT kick-offs. Follow the main Premier League live text for the day's action. How has Ozil been playing? "Mister Assister" aka Mesut Ozil just danced past a couple of challenges to send another Arsenal attack on the way. The Gunners' problem has been the final ball. Bar that little cameo, the German has not been a great influence yet. Give it time. Petr Cech plucks the ball out of the air. As you were. Newcastle have a corner - their first - after Paul Dummett's cross is blocked. What will happen next? BBC Newcastle's NUFC summariser John Anderson: "Newcastle have got better as the game's gone on. They're having a decent little spell. Arsenal have dropped their pace and it's allowed Newcastle to get a foothold." Cheick Tiote will have to go some way to eclipse his magnificent equaliser in the (in)famous 4-4 draw, but a dribble near the area would have pleased the travelling fans. Ayoze Perez's shot a few moments later flies well wide of Petr Cech's far post. 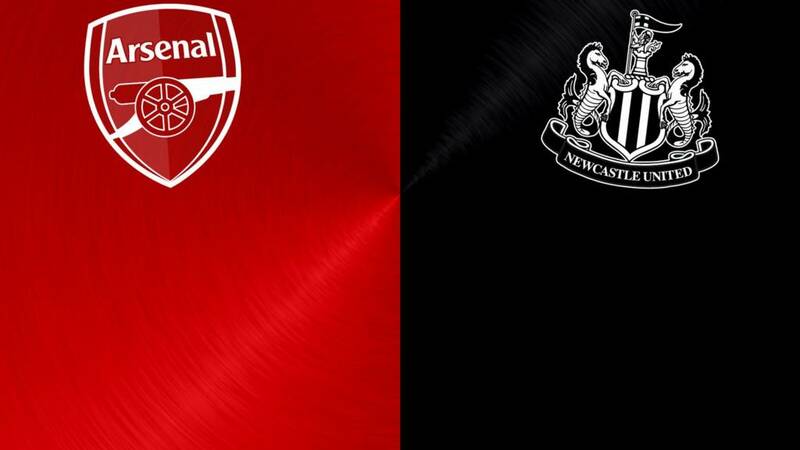 It's all gone a little bit quiet at the Emirates - library-like - Newcastle have settled down after that early Gunners pressure and are passing it about quite comfortably. A chance... in the Arsenal area. Petr Cech, looking to keep his 171st Premier League clean sheet, is forced to dive low to push away Gini Wijnaldum's glancing header. The Dutchman does like a good glancing header. The Magpies have now twice looked dangerous on the counter. Meanwhile, Magpies midfielder Cheick Tiote is receiving treatment on the pitch. Seems like a bang to the head. Hector Bellerin must have exceeded 10,000 steps on his fitness watch. The Spanish full-back yet again travels down the right and sends in another delivery that Newcastle clear for a corner. Nothing comes from the resulting set piece. Daryl Janmaat - a very good attacking full-back - speeds down the right and sends in a cross that eludes everybody. Promising for the Magpies. Arsenal do allow that space, but the Magpies have to exploit that. The Gunners are looking good today though. "Arsenal are in a strong position in the Premier League and also through to the last 16 of the Champions League again. But they always seem to get injuries - already this season is no exception - so they need to strengthen their squad for the second half of the season. Match of the Day pundits have their say on what each Premier League club needs to do in the January transfer window. Arsenal have another corner. It comes from the Gunners right again. Newcastle clear, but it wasn't pretty. Hector Bellerin and Alex Oxlade-Chamberlain causing a lot of mischief down that flank. Fancy a cricket score here today? Hector Bellerin surges again down the right and finds Alex Oxlade-Chamberlain, who stretches in making contact with the ball and only manages to fire wide. Newcastle coach Steve McClaren is probably looking at his watch.. counting down the minutes. The Gunners have an early corner after Fabricio Coloccini has to clear a dangerous ball from the right. The set piece comes to nothing. The Magpies are under pressure straight away. There is a minute's applause for the former Newcastle keeper. All fans are on their feet. A great sight. The Newcastle team come out on to the Emirates pitch wearing training tops with 'Pavel is a Geordie' and featuring a picture of former keeper Pavel Srnicek, who died last week at the age of 47. "Arsenal have their noses in front going into the new year in this most unpredictable of seasons and have their best chance of winning the title in years. "However, they'll need to avoid too many more slip-ups like the one at Southampton on Boxing Day, and won't necessarily find this a straightforward encounter. "Newcastle have shown they are capable of raising their game against some of the better sides despite their own lowly league position. "I was at White Hart Lane shortly before Christmas to see them take all three points off Tottenham and they've also beaten Liverpool inside the last month." For the travelling fans and other Newcastle supporters it has been an emotional week following the death of former Magpies goalkeeperPavel Srnicek, at the age of 47. The former Czech international was one of 'The Entertainers' in former manager Kevin Keegan's side that came narrowly close to winning the Premier League title in 1996. His effervescent manner endeared him to the Newcastle faithful, and others in football. The fans at the Emirates will no doubt pay tribute to the adopted Geordie. Arsenal keeper Petr Cech has just been awarded a framed photo of himself for breaking the Premier League clean sheets record the other day - 170 - against Bournemouth. I wonder where he'll hang that? So what is the secret to Arsenal midfielder Mesut Ozil's success this season? The Germany World Cup winner has produced 16 assists in 18 matches for the Gunners to help them to the top of the table. Manager Arsene Wenger says keeping the 27 year old fresh is key. "Mesut, I gave him a one-week holiday during the international break," he said. "He is a guy who, once the basic fitness is there between the games, he wants to play. There are types of players, sometimes the most technical players, it looks like it demands less energy for them to play - it is just natural for them." Think you know your football? Test your expertise by playing our game and seeing how many results you can predict correctly. See how your guesses fare against other supporters and pundit Mark Lawrenson, plus get feedback from BBC Sport's team including Gary Lineker and Alan Shearer. What are you waiting for? Arsenal centre-back Laurent Koscielny returns to the starting XI as does midfielder Mathieu Flamini, who has recovered from a minor ankle injury. Nacho Monreal is in the side for full-back Kieran Gibbs. Newcastle goalkeeper Rob Elliot is back between the sticks after recovering from an illness, while Cheick Tiote replaces the injured Vurnon Anita in midfield. Is this the year the Gunners will win their first league title since 178... since 2004? They could potentially have a six-point lead by the end of play today. So many near-misses in recent years, so dare to dream Gunners fans? No? Understandable. As for their opponents, it seems like one step forward and two steps back. Newcastle have lost their last two league games and sit two points adrift of safety in 18th. And for those who think a shock might be on the cards... Arsenal have won the last eight meetings between the sides. Stay here for all the action from the Emirates and you can keep up to date with all the build-up to today’s games here.